Micro-LED (also known as mLED or µLED) is a display technology that is based on tiny (hence, micro) LED devices that are used to directly create color pixels. Micro-LED displays have the potential to create highly efficient and great looking flexible displays, to challenge the current high-end OLED displays. Current so-called LED displays are actually LCD displays that use LED as backlighting units - which are always on with a liquid-crystal layer that is used to create the actual image (i.e. block the light where needed). 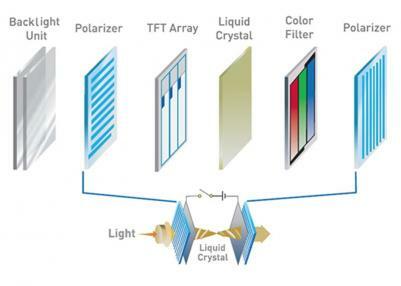 This complicated LCD structure results in a device with serious image quality drawbacks (mainly a low response time and relatively poor contrast ratio) and also difficulties in achieving flexibility and high-quality transparency. Compared to an LCD display, a micro-LED is much simpler, as the LEDs themselves emit the light and can be individually controlled. This results in displays that offer a much better image quality (contrast, response time) and are highly efficient, too, as there are no filters as in LCDs. 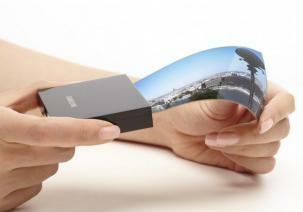 As opposed to LCDs, micro-LEDs can be made flexible. OLED is the current premium emissive display technology, already adopted in many mobile devices, wearables and even TVs. In 2017 around 500 million OLED displays will ship to companies such as Samsung, Apple, LG, Sony and others. OLEDs can be made flexible, foldable and even rollable and the displays offer the best image quality currently in production. OLEDs use tiny sub-pixels made from organic emissive materials. Micro-LEDs are somewhat similar - but with an inorganic LED structure. Compared to OLEDs, Micro-LEDs promise to be much more efficient and bright, more durable (higher lifetime) and with a higher color gamut. Micro-LEDs are based on well established LED devices, which means that it could potentially be a technology that is relatively easy to scale up. There are two ways to make Micro-LED displays. The first and most common one involves growing the LEDs on a wafer, produce the backplane (substrate + electronics) and then move the tiny micro-LEDs from the wafer onto the display electronics. This requires a fast, precise and reliable process (called Pick-And-Place). An alternative monolithic method involves growing the LED chips directly on the display backplane. This removes the complicated pick-and-place method, but is limited in size as it is not easy to grow LEDs on large substrates. The Micro-LED market is still at a very early stage. The only Micro-LED display in production is Sony's Canvas Display (or CLEDIS) - a large outdoor tiled Micro-LED display that is based on 320x360 tiles. 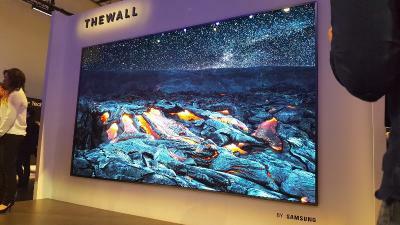 In early 2018 Samsung has unveiled its first Micro-LED display, the 146” WALL – which is also made from tiled displays. Samsung will ship this display commercially in 2018, and LG already announced it will also reveal a similar display soon. Apple is also a leader in Micro-LED displays, although Apple’s development status and plans are not known yet. In addition, there are dozens of companies that develop Micro-LED technologies, components and processes.